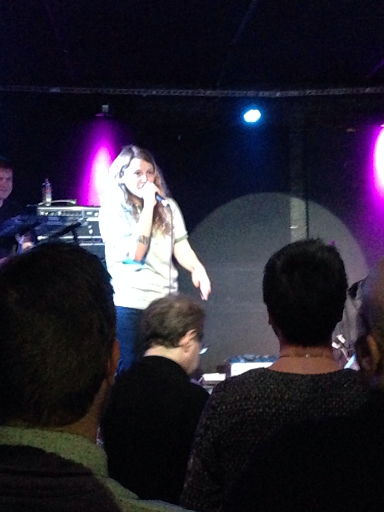 Kate Tempest, whose Everybody Down was one of the best albums of 2014, made her NYC debut of that material at Mercury Lounge earlier this week. While her version of hip hop may not be one of the most unusual to come from outside the U.S., it is certainly some of the most accomplished. So it definitely felt like a bit of a moment when she took the stage just miles from where hip hop was born in the playgrounds and clubs of the South Bronx. This was on Tempest's mind as well as she seemed nearly overwhelmed by her proximity to the locus of music that had changed her life. "If America is an empire," she told the crowd, "It's an empire built on music." She was effusive and endearing when describing how much hip hop had done for her and her hometown of Lewisham in South London. "The two of us made this album in a house in Streatham," she said, indicating producer Dan Carey, who was playing keyboards that night, her facial expression saying more than words about how distant that felt from the big streets of NYC. But mostly she let her music do the talking, spitting fire on The Beigeness to start the night and showing amazing stamina throughout. Her slightly raspy voice is incredibly versatile, conveying vulnerability and toughness with mere inflection, and inhabiting the different characters in her songs like second skins. She performed several songs from Everybody Down, but one of the most memorable performances was of her latest single, the spare and haunting Bad Place For A Good Time. Although most of her music could be described as hyper-verbal, she took the end of the song to a place beyond language with heavy echo on her voice, creating an effect somewhere between dub and Yoko Ono. As on every song, Dan Carey followed her lead, ably assisted by a drummer and a remarkable singer/dancer/hype-woman who danced like a hooded wraith on the right of the stage, finishing lines, singing hooks and providing atmosphere and moral support. Carey is a bit of a wizard, conjuring tech-heavy scaffolds of rhythm and melody, touching on digital dancehall, garage and grime. I found it relentlessly danceable the first time I heard it, but it took a while for the crowd to warm up to it. I suspect that won't happen next time Tempest is in town. In any case, she was the star - kinetic, commanding, cerebral, carnal - in short, fully human. Instead of a traditional encore, we were treated to her other side, that of the Ted Hughes Award-winning poet, when she delivered her poem Progress alone on stage. It was a stunning display by a protean talent. "More empathy, less greed," Tempest said before she left us, and it's hard to argue with that. Preachy? Slightly - but she's earned her pulpit with the complex and compassionate portraits she etches in her songs, like a hip hop Hogarth prowling the streets of London, one hand on her huge heart, another on her incisive pen. Watch Kate Tempest perform The Beigeness at the BBC 6 Music Festival 2015.